At our West Seattle Campus you’ll find a weekend service for every age to grow in faith! There’s nothing quite like visiting a new church for the first time; there are so many new faces and strange places, and it feels as if you stand out. You’re not alone—we have all been there. When you arrive at Eastridge West Seattle you’ll be welcomed into a friendly, casual environment by people who are excited to see you! Our Guest Services team is throughout our building to help assist you with any questions or needs you may have. A time to learn. Each service is about 75 minutes long and begins with high-energy, live worship. Most weeks the message is broadcast live from our Issaquah campus. You’ll hear an engaging and thought-provoking message from the Bible taught by lead pastor Steve Jamison or a member of the preaching team. Our campus pastor will wrap up the service with an invitation to respond to the message and pray with a team member. Looking for more? Learn more about our weekend adult equip classes offered during both services. A place to connect. The HUB is the perfect place to connect and learn more about Eastridge. Have a question? 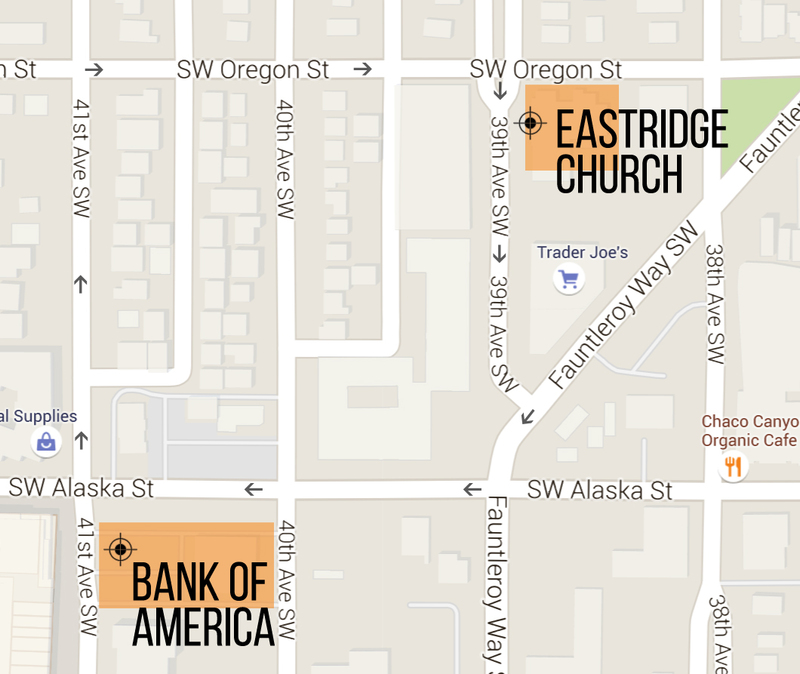 Curious what your next step is at Eastridge? Swing by before or after service — we would love to personally meet you and give you a gift! A place just for kids. Each weekend at Eastridge Kids, newborns through 5th graders learn the truth about who God is and who they are because of Him through age-specific lessons, interactive elements, small groups, and trusted adult leadership. A time for community. Middle and high schoolers connect with each other and with God in our weekly Youth Connect at 9am. Fun games, discussion, and relevant teaching. A piping hot drink. The coffee and tea flow freely at Eastridge. Come a few minutes early and grab a cup of free coffee or tea before heading into service. We know parking can be hard to find in West Seattle. 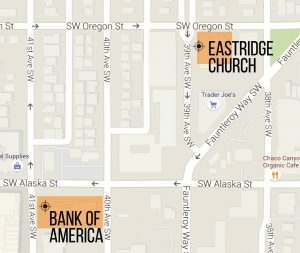 Find a guaranteed parking spot at the Bank of America on SW Alaska St. (between 41st and 40th Ave. SW). It’s just a three minute walk to Eastridge and saves you the hassle of looking for a space!